Tonight we ask the question, “Have you ever seen a tree grow out of a human torso before?” If the answer is no, then I'm happy to say tonight is your lucky night, as we unspool the Indonesia ultra-weirdness of Special Silencers. Indonesia's peak export period for its genre films was from the early Eighties to around 1992, grinding out cheap direct-to-video exotica for a world market already saturated with kung fu and jungle-bound action films – but with the added ingredients of bizarre fantasy and horror, genuine tropical locales, and always with ridiculous death-defying stunts and action sequences. For me, Indo cheapies are always a pleasure and never a guilty one, and part of the pleasure is watching their incongruities and extreme thrills kicking a film's weirdness level to the next building. 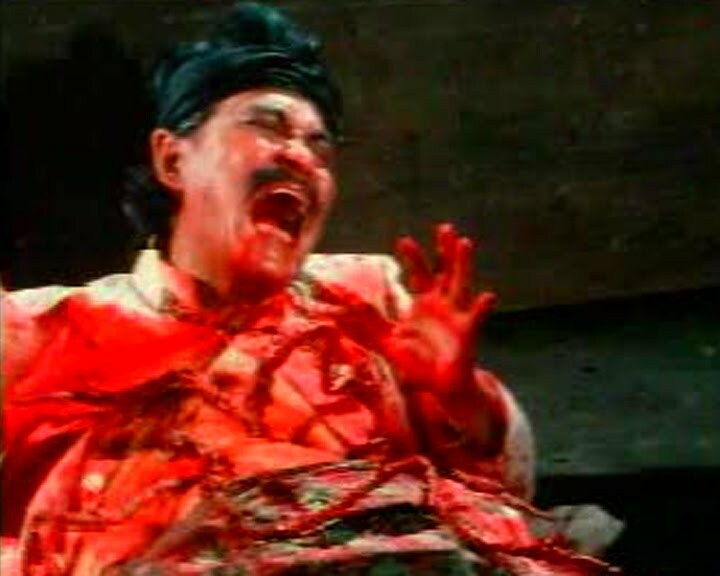 Special Silencers stars Indonesia's B King Barry Prima, a staple in Indo-horror, fantasy and action cinema, and his would-be Jackie Chan hair helmet and fight moves define the landscape of one of the wildest, if little-seen cycles in Asian cult filmdom. Call it Indo-nausea or Satay Splatter, or whatever sticker you want to put on it, I GUARANTEE you will not have seen anything like it before. By 1979, Prima was already comfortable in his blow-dry coiffure and denim suit to call himself Indonesia's Number One Action Star. Here he plays young buck Hendra heading for his classmate Dayat's village, meets a pretty girl along the way just happens to be Dayat's sister Julia (action star and Prima's ex-wife Eva Arnaz), and attempts to woo her from his motorbike. Smooth. Unbeknownst to both of them, Dayat's uncle and mayor of the village has been usurped by a black magician who has his evil eye on the mayor's chair, using a secret weapon, a vial of little red pills – those “special silencers” hinted at in the title – to take over the village. Once ingested by the hapless victim, fully grown trees shoot out of their stomach. I repeat: TREES, complete with branches and complex root systems, BURST from their victims' stomach. Hendra uses his considerable martial arts skills to help Dayat and Julia defeat the arch-villain, his army of thugs, and his “black commandos” - a squadron of hungry rats (alright, they're mice coloured with textas). Special Silencers is a typical South East Asian genre film, a cheerfully simple-minded tale of revenge and retribution, with its inherent rough-as-guts production values and atrocious dubbing. Don't forget, it's an Asian film from the Seventies, so there's kung fu. A LOT of kung fu. What sets Special Silencers and its Indo ilk apart from most B-fare are its jaw-dropping money shots. Try for instance Julia's torture sequence where she's forced to smell someone's gym shoes. Just kill her, you fiend! Or the villain trying in vain to ram his severed leg back onto the stump... Then there are the film's money shots, those pesky little red pills doing their assigned task, which surely must rank amongst the most absurd moments ever in film horror AND horticulture. Indo-nausea indeed! I hope you enjoy the 1979 Special Silencers.